Joshua Ziegler, a doctoral student researcher in Alemán's lab, and colleagues drilled holes—500 nanometers wide and four nanometers deep—into a thin two-dimensional sheet of hexagonal boron nitride, which is also known as white graphene because of its white color and atomic thickness. Using optical confocal microscopy, Ziegler next observed tiny spots of light coming from the drilled regions. After analyzing the light with photon counting techniques, he discovered that the individual bright spots were emitting light at the lowest possible level—a single photon at a time. 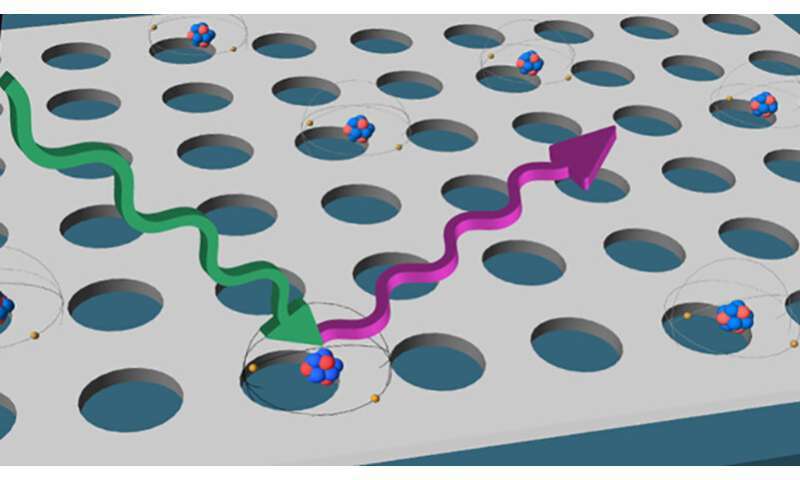 This sounds like a big deal, but I do not understand how and why these holes in the 2-dimensional boron nitride should emit single photons. At 500 nm wide the holes are enormously larger than any atom.